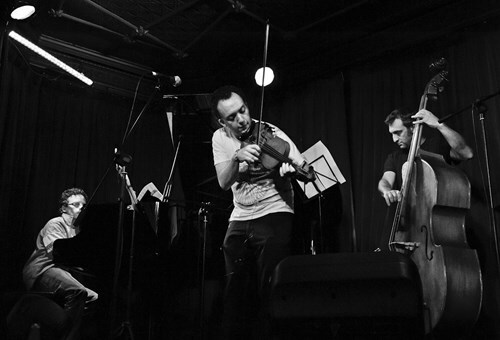 Berlin-based violinist and composer-producer Daniel Weltlinger on his bi annual visit to Sydney returns to Camelot Lounge to present a night of New Jewish Music presented by Zohar's Nigun featuring guest singers Nadya Golski, Evelyne Weltlinger and more. Widely acclaimed for his distinctive warm sound and innovations within the genres of Gypsy-swing, jazz, klezmer and experimental/free-improvised music, Weltlinger has performed and recorded in Australia, Europe, China, Morocco, Turkey, the US and Israel, and regularly collaborates with many renowned artists and ensembles including German-Sinti guitarist and composer Lulo Reinhardt, Berlin based Yiddish singer/actor Karsten Troyke, the multi-ARIA Award-winning Gyp-rock band Monsieur Camembert and Danish bass player and composer Kenneth Dahl Knudsen amongst many others. He runs the independent record label Rectify Records, which produced the album ‘Koblenz’ nominated as amongst one of the best albums of 2015 in Downbeat Magazine and which also produced the widely acclaimed album 'The Four Questions' by Zohar's Nigun released in 2012. Zohar's Nigun is an experimental-chamber-jazz project that explores the very essence of the complicated and fractured nature behind what shapes identity in the 21st Century using the analogy of four musicians of Jewish heritage who mix both original and traditional music to explore these concepts. The band is comprised in addition to Weltlinger of a top lineup comprising of pianist Daniel Pliner (Mr Ott, The Asthmatix), drummer/percusssionist Alon Ilsar (The Sticks, Brian Campeau) and bassist Simon Milman (Wanderlust, Los Chavos) and the night will feature in addition to works by Zohar's Nigun original compositions by singers Nadya Golski, Evelyne Weltlinger and more.